Our new product line of compounds, the smart system HiMiX, provide products to a wide range of industries, including service industries and cleaning, textile processing, etc. HiMiX are a complete line of superconcentrated products for a full range of sector that meet stringent customer and regulatory requirements. Our new technology has enabled our industry to reduce the size of the package to achieve higher densities. The higher density compounds can be packed in much smaller packages than were needed previously. Being an environmentally friendly product. The compound of the Line HiMiX are complete products hyper concentrate depending on which product you want to achieve is diluted in proportion with only sweet water. We offer advice on the production process of formulations to increase productivity and minimize operational costs, making constant improvements in the health, safety and environmental protection. Those described in this brochure are standard, but depending on the needs of the client is possible to formulate compound and provide materials to the particular specifications. The simplicity of implementation allows anyone to be able to develop it and of course use it on its territory. First, this makes you autonomous and not thinking about all the problems with the purchase of all components, research and development of the formulation. That gives the opportunity to focus on production and distribution of the finished product, since the advantage of lower acquisition cost, lower waste warehousing facilities, lower transportation costs, lower packaging costs, less waste and disposal costs and ultimately increased profitability. 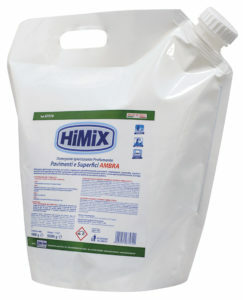 HiMiX ESSENZA is an innovative product with an excellent performance; it can be used in any environment. With four different functions: 1 PERFUMES, 2 REMOVES ODOURS from internal environments, 3 CLEANS, 4 REMOVES DUST from surfaces. The unique, original and long-lasting fragrances capture the FRESHNESS of flowers, the ESSENCE of spices and all the SWEETNESS of fruits with their evocative bouquets; characterized by the COLOURS which are made, they give PLEASANT sensations to create the right atmosphere of COMFORT in your internal environments. It is not easy to describe the different notes that each fragrance is composed: according to our experience, we can say that every person FALLS IN LOVE with our fragrances, produced to satisfy many “TASTES and SENSATIONS”… …We Make them all Colours. USAGE AFTER MIXING: 1 ml of product in 1 l of water to clean and deodorize any washable surface; spray pure product in the environment to deodorize; pour few drops into drains to neutralize unpleasant odors; spray the product on a cotton cloth to dust furniture and frequently used objects. It is a high quality concentrated detergent that sanitizes and maintains surfaces, ceramic, marble, parquet and teak pavements; also indicated for cleaning vertical surfaces, revetments; ideal for cleaning sanitary, showers, washbowls. Sanitizing detergents for Floors and Surfaces multifunctional concentrated detergent with an antistatic effect that releases a long-lasting fragrance; it leaves no halos and fits perfectly for daily cleaning; available in 3 differents lines: Classic, Hypoallergenic, and Luxury for a total of 20 unique fragrances. Its deodorant action, thanks to the unique RubinoChem’s essences, leaves a sensation of freshness which exalts its cleaning action. USAGE AFTER MIXING: Dilute 5 to 20 grams of product in 1 l of water. For hard dirty or a superior persistence of perfuming action use 30 grams of product in 1 l of water.